Healthcare leaders are increasingly concerned about the security of clinical communications in their organizations. The enhanced HIPAA enforcement environment, a number of well-publicized breaches and settlements and a simultaneous increase in the use of asynchronous electronic communication in the clinical environment — specifically text messaging — have made the issue top-of-mind for many leaders. They are concerned about the potential dangers of the transmission of protected health information (PHI) without adequate safeguards; the risk of privacy and security breaches that may result in adverse legal and financial consequences; and the loss of patient trust and reputation in the marketplace. The recent uptick in the use of text messaging for clinical communications has resulted in a greater focus on the security of text messages sent via mobile devices. While secure text messaging is an important aspect of clinical communications security, simply addressing the security of text messaging leaves organizations vulnerable to breaches in other modes of communication, such as voice messages and texts sent from mobile carrier websites, Web-based paging applications, call centers, answering services and hospital switchboards. PerfectServe is a communications system that stores data on a secure server, rather than on individual devices, thus maintaining the security of messages sent via the system, no matter which mode of communication is used. 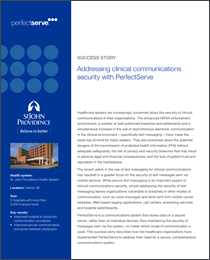 This success story describes how two healthcare organizations have implemented PerfectServe to address their need for a secure, comprehensive communications system. The organization had implemented PerfectServe in 2007 to facilitate communication between the system’s staff and individual physicians. In September 2013, the health system added a PerfectServe module to ensure secure direct communication between physicians. The calling physician can access PerfectServe via a smartphone or by dialing a toll-free number, which allows him or her to bypass answering services, front office staff and switchboards to quickly contact colleagues for real-time discussions of patient care issues. If the receiving physician is unavailable, the calling physician can leave a secure, HIPAA-compliant voice message, which the recipient will receive immediately or at a predefined future time. KishHealth System is a community-owned health system in the DeKalb, Illinois area that includes 98-bed Kishwaukee Hospital, an acute care facility, and 25-bed Valley West Hospital, a critical access hospital. In addition, the health system provides hospice, home health, behavioral health and cancer care services and serves the local community with almost 39,000 ED visits and about 8,300 admissions each year. According to Michael Kulisz, Jr., DO,chief medical officer of the health system, physicians were finding it difficult to efficiently and securely communicate patient-related information. For example, when a physician requested a consult from a specialist via the computerized physician order entry (CPOE) system, he or she might also text the consultant with a specific question. In order to comply with HIPAA privacy regulations, however, both physicians had to exclude specific patient information. This process, and any follow-up discussions after the consultation, often required one or more telephone calls to communicate patient-specific information — which frequently resulted in callbacks and phone tag. In addition to the lack of direct information exchange, the process was frustrating for physicians and slowed patient flow through the hospital. Health system leaders realized that the organization needed a platform for securely communicating PHI between physicians. Compliance with HIPAA privacy and security regulations has become a priority for healthcare organizations. The use of text messaging highlights the importance of a secure platform for all modes of clinical communications. St. John Providence Health System in Detroit and KishHealth System in DeKalb have implemented PerfectServe to successfully streamline communication between physicians and ensure a secure environment for the efficient exchange of PHI and other clinical information.